The home video price is $35 per DVD, plus $10 shipping. *Home video DVDs are not licensed for use in universities, schools, public libraries or government agencies – or any public screenings. 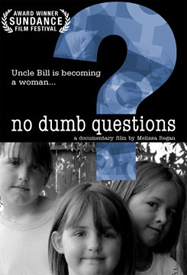 Please support the filmmakers who made “No Dumb Questions” by purchasing an educationally licensed DVD or applying for public performance rights HERE if you intend to host a classroom or public screening.